Starring: Gerard Butler, Lena Headey, Dominic West, David Wenham, Vincent Regan, Rodrigo Santoro. 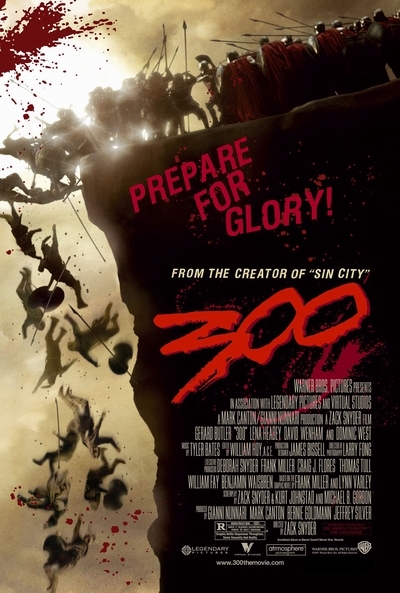 Story: "300" is an adaptation of Frank Miller's epic graphic novel. Using hyper-real renderings similar to Miller's own graphically stylized illustrations, the film tells the true story of 300 elite Spartan warriors led by their fearless king Leonidas (Butler), who thwart the charge of Xerxes and his massive Persian army at the battle of Thermopylae. Facing insurmountable odds, their valor and sacrifice inspire all of Greece to unite against their Persian foe, leading to the origins of democracy.